Was Punisher in Captain America: The Winter Soldier? You may remember that before Punisher appeared in Daredevil Season 2 there was wide speculation about where the character could appear. When Captain America: The Winter Soldier came out in 2014 there is a early action scene where a group of fake police officers attempt to assassinate Nick Fury. 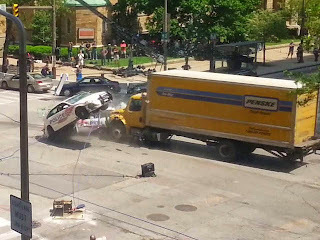 Fury ends up in a car chase and manages to dodge 2 of the chasing cars by braking hard before an intersection where a Penske Truck takes out two of the cars. There was an off the cuff remark made by Joe Russo about that Penske Truck driver being someone special. While I believe he meant this as a joke it did throw the Internet into a tizzy because many fans took this as an indication that the driver of the truck could be...........The Punisher. Well fast forward to 2017 and the Punisher is getting his own show and just released the most heavy metal trailer ever. In that trailer is a scene where a car gets cleaned out by a moving truck. While this is not the same truck as the one seen in the Winter Soldier I do wonder if its a bit of wink or an homage to that old fan theory from 2014. Punisher and Winter Soldier Connections? The Punisher has returned but you did not even know it! Comments by the Russo brothers are generating speculation that Punisher may have made a quasai appearance in the movie Captain America the Winter Soldier. In an interview posted by Comingsoon.com the directors of Captain America the Russo Brothers reveal that the Penske truck that slams into assassins hunting down Nick Fury, then later runs over Hydra agent Sitwell was driven by a very specific person. "The man who drives that truck... Is very highly trained. He thinks on his own terms. He's got a plan and a very specific skill set." Before this revelation I think many people assumed that it was two different Penske trucks that randomly effected the action scenes. If we were to take Russo's comment seriousily (And I don't think we should) it would mean there is another story here, an unknown character with a "specific skill set" intervened within the movie. To me the lethality, penchant for flying under the radar and skills point toward the Punisher. Is Frank Castle driving the Penske truck?